Main bag has two compartments, one is a gun holster plus pouch suitable for tools and quick release clamps commonly used in metal stud work. Designed for right side, holster is suitable for cordless drills or screw guns. Complimented by our patented 2 in 1 design outer pouch. Holders for driver bits & pencil. 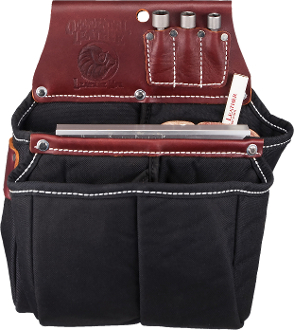 Also sports a leather sleeve for Clip-On items on right rear and a slot for Rafter Square behind the 2 in 1 outer pouch. Square edge to the rear. Ideal for metal framing.